Torture in Sri Lanka – Am I bovered? It’s Sri Lanka charter flight week again. The UK Border Agency (UKBA) press team are coming out with their tried and tested quotes to deflect any criticism of their cynical operation. Guess what the UKBA said in response to a new report by Human Rights Watch about the extensive sexual violence perpetrated by the Sri Lankan military? Something the UKBA press team aren’t likely to tell us this week is what happened when the Council of Europe’s Anti-torture committee inspected their recent Sri Lanka charter flight in October 2012. “Examined for the first time the treatment of foreign nationals during an operation of deportation by air. The monitoring took place in the context of an ad hoc visit to the United Kingdom from 22 to 24 October and involved the presence of the CPT’s delegation on a charter flight between London and Colombo (Sri Lanka). The delegation also held consultations with Colin PUNTON, Returns Director at the United Kingdom Border Agency (UKBA), as well as with senior representatives of Reliance, the private security company contracted by the UKBA to provide escorts for deportations by air. I submitted a Freedom of Information request asking for copies of minutes or other notes from meetings between the UK Border Agency and the Council of Europe’s CPT during these dates. Their response was: “We have carried out a thorough search and we have established that the UK Border Agency does not hold the information which you have requested”. In other words, no one in the UK Border Agency bothered to record what was said between their Director responsible for a highly controversial charter flight programme and the Council of Europe’s anti-torture inspectors. Was nothing jotted down even by some members of UKBA staff who sat with them on the long-haul flight all the way to Colombo? This shows the staggering sense of indifference and impunity that senior civil servants at the UKBA hold when it comes to sending people back on mass to a well-documented risk of torture. Any reassurances issued by their press team this week suggesting the UKBA care at all about the situation in Sri Lanka are completely disingenuous. Urgent Statement: Stop torture flight to Sri Lanka on 28th February 2013! Stop the charter flight to Sri Lanka on 28th February 2013! Since June 2011, the UK Border Agency (UKBA) has hired 8 aircraft to forcibly return planeloads of people to Sri Lanka. Tamils sent back on these flights have been tortured. This is well documented through medical reports by Freedom from Torture and Human Rights Watch. The UKBA know it is unsafe to return Tamils to Sri Lanka. But the Agency is turning a blind eye, at the behest of people higher up in the British State who have blood on their hands. Every UKBA plane that lands in Colombo is a propaganda victory for the Sri Lankan government, whose leaders face credible accusations of war crimes and ongoing genocide against the Tamils. A conflict the British elite manipulated to satisfy their own geo-strategic and commercial interests. Now, President Mahinda Rajapaksa is consolidating authoritarian rule, attacking the independence of the judiciary and freedom of the press. 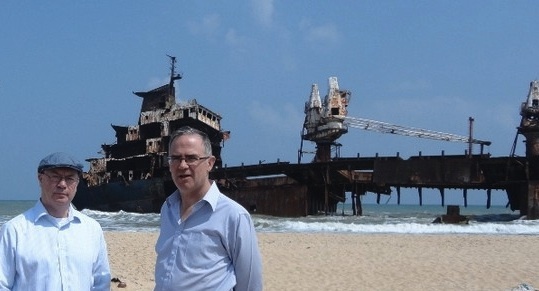 Every UKBA plane that lands in Colombo is a green light for British businessmen to ignore humanitarian concerns and profit from the highly lucrative military occupation of Tamil lands and seas. British companies are building hundreds of bridges in the north and east of Sri Lanka to connect new settlements of Sinhalese soldiers and their families. UK-listed corporations are exploring deep-water oil & gas reserves off the west coast of Sri Lanka. Tamil farmers and fishermen are being displaced by the Sri Lankan Army and Navy to facilitate a ‘land grab’ by foreign investors. The Conservative Ministers, MPs and Peers who defend the Sri Lankan Government do so because they are in bed with these companies. Every UKBA plane that lands in Colombo terrorises Tamil dissidents in the diaspora. 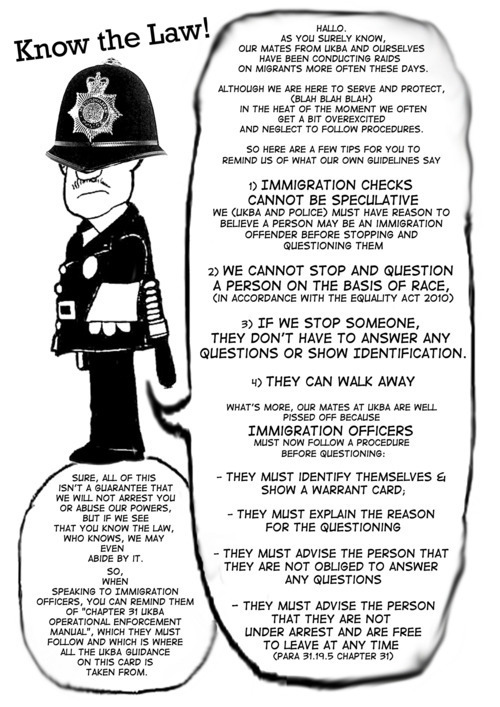 UKBA charter flights are a strong-arm tactic designed to intimidate immigrant communities who pose a threat to the power structure. Charter flights restrict migrants’ access to legal help, and involve logistical arrangements described as “inhumane” by a cross-party Parliamentary group. The secretive aircraft and coach companies which profit from transporting immigration detainees to their final destinations are nothing more than torture taxis. 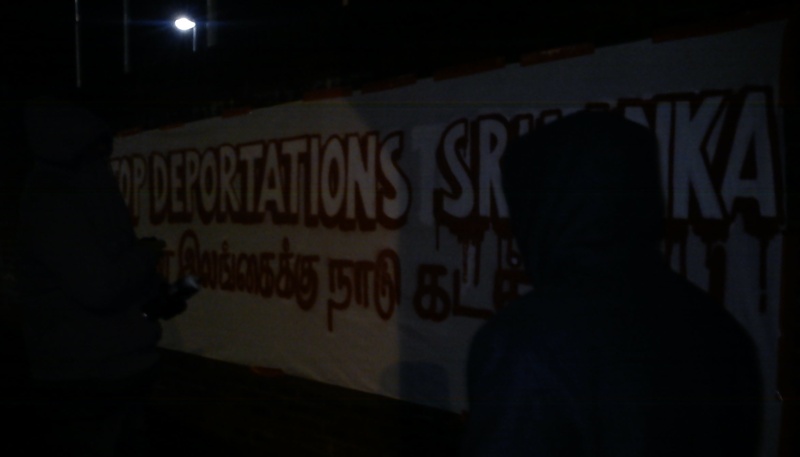 Still, persistent resistance from the grassroots is making the British Establishment think twice about sending Tamils back to their persecutors. A court case began this month about the UKBA’s country guidance on Sri Lanka. The hearing is adjourned until the end of the month. How can the UKBA proceed with another charter flight before a ruling has been made? We demand that deportations to Sri Lanka end immediately. Please send it out to your friends, networks, anyone that might be interested. You can also write to your local MP and the Home Secretary to protest against the flight. A British Foreign Office Minister has refuted medical evidence obtained by Human Rights Watch that Sri Lanka is torturing Tamils after they are deported from Britain back to the Indian Ocean island. During his most recent ministerial trip to Sri Lanka’s capital, Colombo, on 1 February, Alistair Burt MP said ‘the UK has no direct evidence’ of the torture – contrary to the accusations of human rights activists.